Build –up roofing is a proven technique of weather-proofing a roof. It uses many layers of roofing to make a thick water proof layer which will last for very long time if installed with technical and professional excellence. As specialist roof contractors we have vast experience in the application of build up roofing system and can suggest you on the different application methods that are most widely known and can make recommendations for the best choice for your building or project. New high performance felt roofing products can be installed using ancient techniques. Some sites might not permit the use of open flame while applying felt roofing. 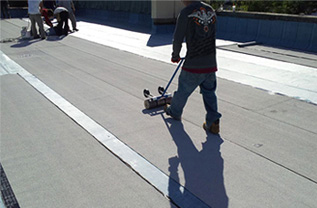 Therefore, in these instances we will provide cold-applied felt roofing, that does not use hot hydrocarbon or need gas torches.